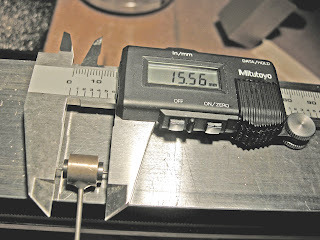 Following on from yesterday’s postings and as a direct result of interest from other association members here are some further notes and a few extra pictures of the set up that I employ when machining ‘N’ wheels to run on 2mm fine scale track. It’s not a definitive treatise on how to machine ‘N’ wheels but it works for me and if it answers some of your questions then fine. I know of owners of large layouts for whom the provision of finer wheels to convert their 'N Gauge stock may be an issue. This is one solution. Don’t be afraid to offer suggestions. I think its fair to say a lathe or some reliable means of holding/turning the work is essential. Always exercise caution when using machinery. Today the pictures are still poor. Light is virtually non existent where they were taken and I have had to rely on a single halogen bulb again. a) reduce the flange thickness/depth. b) adjust the back to back dimension. The thickness of the flange needs to be reduced since if it is not and the wheels are set to our standard B2B of 8.51mm then the wheel set will be out of gauge. If you set your B2B at 8.6mm then this ‘out of gauge’ is even worse. (There is however a good argument for setting the B2B at 8.6mm and that too can be accommodated in this process). I do not think there is anything complicated about machining down the wheel back (see later re collets) and you’ve seen a picture of this being done so I will not dwell too long here. It seems an explanation on how to adjust the B2B of commercial wheels that adhere to our standard of split axles held in a muff may be necessary. If commercial wheel sets are to be returned to the vehicles from which they came (and you wouldn’t be machining them down otherwise) we need to maintain the axle length i.e. between the pinpoints. With the Dapol wagon wheel this is 15.0mm or thereabouts depending on how tightly the measuring device is gripped. (photo above) If this distance is not maintained the wheel set will either not fit in its bearings when placed back in the wagon or slop around loose in them. Either scenario is undesirable. So, having machined the back of the wheel (I remove 0.3mm) put them back in the muff and reset to 2mm Scale Association B2B. 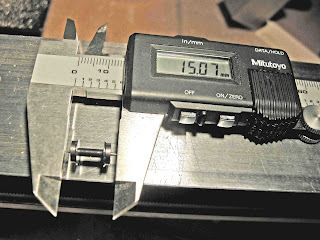 It will be seen that the axle length is now 15.5mm or thereabout (photo below) In order to get this length back down to 15mm the stub axles need to be pushed back through the wheel by something of the order of .25mm. It’s not very much but it does make a difference. I have machined up a holder that will receive the 1.5mm diameter stub axle (photo above) which screws on to the headstock of my Unimat 3. Peter Cark supplied the blanks some years ago already threaded. I do not know if he still does. (Peter lives in a workshop with a house attached – marvellous) Yes I know the end of the holder is a bit raggy – I’ll clean that up later on, it’s functional for now though and that’s what matters. In the tailstock chuck is a piece of steel with a 1mm diameter hole drilled centrally in it. This prevents the pinpoint on the axle being damaged when pushing the axle into the wheel. I am working on a modification which will negate the necessity to go anywhere near the pinpoint with anything that might do it harm. I’ll update when it’s done. 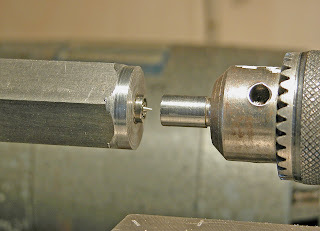 The tailstock is now wound into the work and when the two come into contact (photo above) all that’s needed is to measure how far the axle gets pushed in. It might be felt that the axle would be in danger of being pushed out the back of the wheel but there is still plenty of material to grip the axle so no worries there. The final job is to finish off the flange. 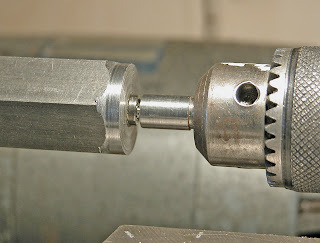 The merest fraction will need removing, in fact with the wheel now held in either the collet or a by the axle in a 3 jaw chuck/mini drill this can be done with a piece of fine emery paper to just get rid of the sharp edge and round it off. 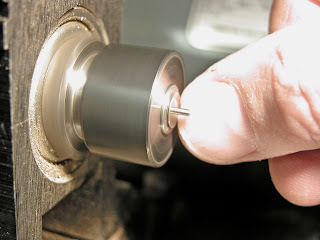 Ideally the flange overall should measure 1mm more then the diameter of the wheel to conform with Association standards which can followed to the letter but it's probably not essential since within those standards there is a certain amount of latitude. Now - a little about collets.